City Sightseeing is an international company and you’ll find their buses in many major cities. 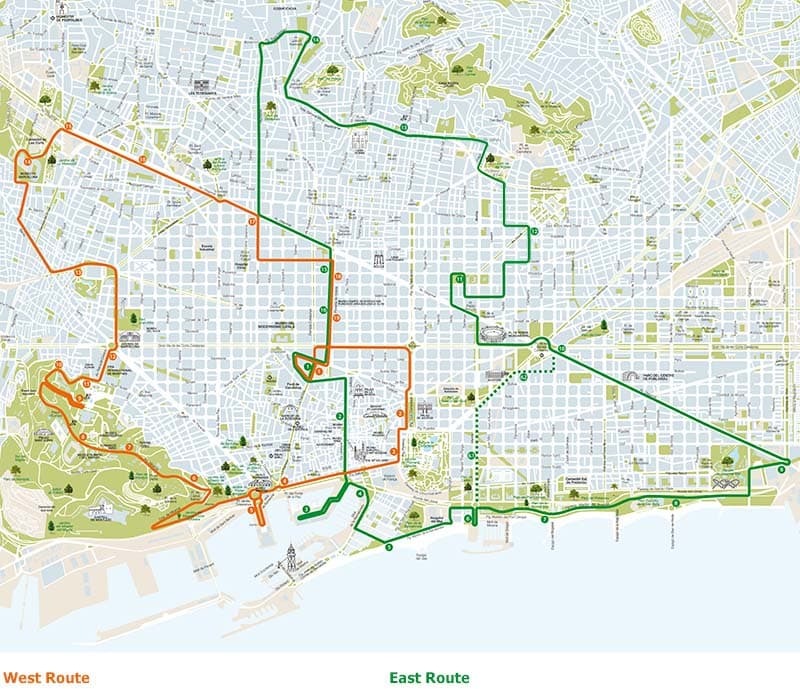 In Barcelona, the Hop on Hop Off Barcelona Bus tour includes three routes, 33 stops and is available in 18 languages! From Roman ruins to Gaudi, the open top double-decker hop on hop off bus will take you through Barcelona with over thirty stops. It is very well rated with most of the reviews leaving positive feedback. It is a favorite for a highlight tour of the city as a whole. Fine Print: Tickets are valid for 3 months, so you can use them anytime within that time frame. Once you start your first trip, based on whether you purchased 1 or 2 day tickets, you must ride on consecutive days. Your first day ends at the end of business hours. Park Güell – NOTE: the bus stop isn’t actually at park Guell, but rather about 15-20 minute walk, uphill. Barcelona Guide Bureau is run by professional, licensed guides who provide a unique bus experience in Barcelona. With over 10 different tour options you can see the highlights to focus on a specific theme during your tour of the city. They are the number 01 rated Bus Tour of Barcelona on TripAdvisor. The specialty tours allow you to skip the lines and enter some of the sites (entrance fee included in booking price) with your own guide. The coaches hold a maximum of 48 passengers. Each coach is equipped with air conditioning, reclining seats, a high quality sound system, and panoramic windows. Cancellation Policy: 24 hours Notice for a full refund. Barcelona City Tours has two routes, The East Route which visits Gothic Quarter, the Aquarium, the seafront, Agbar Tower, the Sagrada Familia and Park Güell and the West Route, the Rambla, the cruise-ship terminal, Montjuic Mountain, the Plaza de España and the Camp Nou Stadium. The buses provide free WiFi, sliding covers for rainy days, and is wheelchair accessible. Attractions Passes are also available. Fine Print: Once you start your first trip, based on whether you purchased 1 or 2 day tickets, you must ride on consecutive days. Your first day ends at the end of business hours.